A few of us ventured out last week for Worcester Restaurant Week. 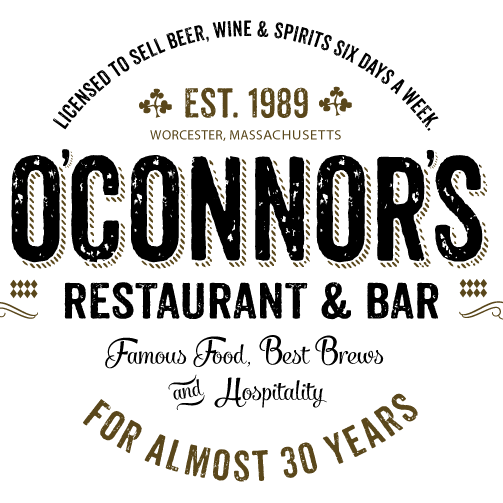 We chose O’Connor’s on West Boylston St. on the Worcester line. O’Connor’s had a multitude of offering for restaurant week. These include several appetizers a dozen entrees and a few desserts. We each ordered something different. I had the butternut squash bisque while my dining companions all chose a salad for their starter. The bisque was rich creamy and flavorful. I have to confess that this is one of my favorite soups. I chose the Guinness steak pie, while one friend opted for the grilled Chilean sea bass, another has the pork schnitzel and a third had the chicken Wellington. I was shocked by the enormity of the steak pie. It was literally the size of a football. It was packed with large pieces of beef, carrot & potatoes all bathed in a luscious brown gravy and topped with a flaky crust. All the meals were large. The pork literally filled the plate and hung over the edges. The sea bass was a filet of half a fish simply grilled. The Chicken Wellington was a chicken breast covered with mushroom duxelles and wrapped in a flaky pastry. We ended the meal by each ordering the Irish bread pudding, which was served warm and topped by a warm caramel sauce and accompanied by a scoop of vanilla ice cream slathered with whipped cream.